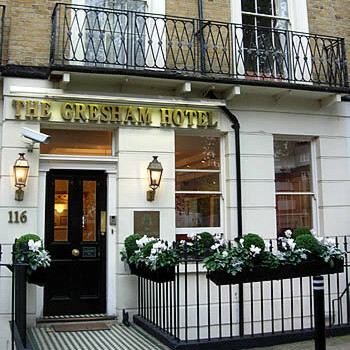 We stayed in the Gresham for 2 nights whilst attending a concert in Dublin. Found it to be a very friendly and comfortable hotel. Its location was ideal for the shops and getting around. Bus from the airport dropped us right outside the door. I got quite a good deal for the 2 nights and would definitely stay here again if the price was right! Despite having read earlier reports rgarding this hotel we found it excellent in every way. It has clearly been refurbished at great cost and we found the facilities to be first class, the food very good indeed and the staff vry friendly and helpful. Our room was well maintained and comfortable and we could not fault the hotel in any way. There was an ironing board and steam iron in the room and a very good hairdryer. The coffee/tea making facilities were always replaced every day. There was also a free broadband connectiion for use of guests. It's certainly not the cheapest hotel in Dublin but we thought it was good value for money. Looks like its been redecorated recently. We had a group trip to Dublin, the Gresham was very expensive. The Hotel is very large and situated opposite the Post office In O'Connell St.
We thought that the hotel was very expensive and generally showing signs of wear and tear. The En-Suite was very small. I think the hotel is now relying on it's past reputation and needs a complete review from the ground up.